Do you have a minute to spare to learn some English? Tom's going to tell you how to use the future continuous tense. Give us 60 seconds and we'll give you the English! Hi everyone. Tom here for BBC Learning English. 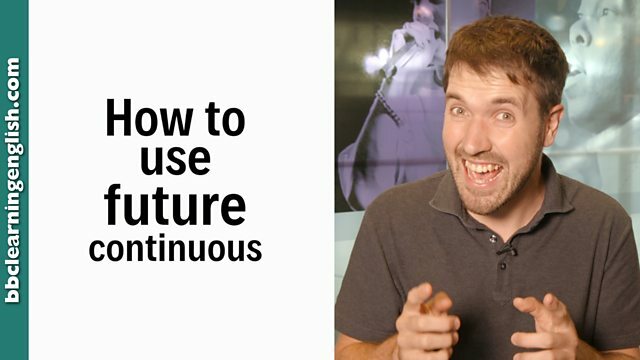 Today, I'm going to show you how to use the future continuous. We use the future continuous to describe actions in progress at a future point in time. For example: In the next scene, I will be wearing a jumper. We make the future continuous using will + be and verb(ing). Note that we can use any subject pronoun and the structure won't change. For example, these are my hands. The subject pronoun is 'they'. In the next scene, they will be holding a melon. So now you will be thinking about how to use the new grammar. Why not give it a try? The future continuous tense is formed using will + be + verb(ing). Remember that the verb will does not change its form for any subject pronoun: I / you / he / she / it / we / they will + be + verb(ing). In the next scene, I will be wearing a jumper. Will you be flying by this time tomorrow? They won't be starting construction until later this year. We use the future continuous to describe actions in progress at a future point in time. In the next scene, I'll be holding a melon. I'll be studying this weekend because I have an exam on Monday. Due to delays, we won't be landing at the airport until much later this evening. You need three words. A future verb form and a continuous verb form. What's the verb form of the future continuous tense? We use the future continuous for an action in progress at a future time. Check the time words to make sure.